As Congress negotiates a funding bill to keep the federal government open, FIU’s Institute of Water and Environment leadership engages with White House and Congressional leaders; West African research dialogue convened; Law Dean R. Alexander Acosta confirmed as Secretary of Labor; and corporate partner Ryder Systems, Inc. visits FIU in DC. 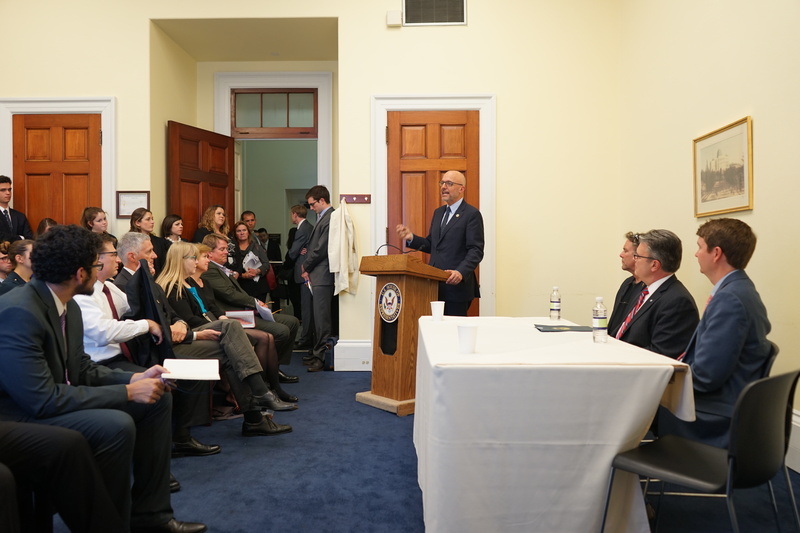 Congressman Ted Deutch (FL-22) kicks off the Coastal Sustainability Briefing on Capitol Hill. As the Trump administration nears the end of its first 100 days in office and in the midst of budget negotiations for fiscal year 2017, Todd Crowl, director of FIU’s Institute of Water and Environment (InWE), met with leadership from the White House and Congress April 26 to advance FIU’s capacity to help the federal government preserve our global water and environmental resources. Mario Loyola, associate director for Regulatory Reforms at the White House Council on Environmental Quality, met with Crowl to discuss the importance of adaptation strategies for South Florida’s ecosystem as it faces environmental challenges such as sea level rise and storm surge. Loyola conveyed the importance of the work FIU is doing to restore the coastal Everglades and expressed interest in collaborating with FIU to advance solutions to these critical challenges. The meeting was followed by impromptu visits to the offices of Carlos Diaz-Rosillo, director of Policy and Interagency Coordination at the White House and former visiting professor at FIU, and Helen Aguirre Ferré, director of Media Affairs at the White House. 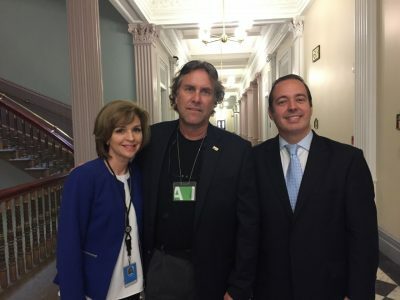 Todd Crowl (center) meets with Helen Aguirre Ferré (left) and Carlos Diaz-Rosillo (right) at the Eisenhower Executive Office Building. “I took away a sense that this administration is thinking about infrastructure in the broadest sense – not just bridges, dikes and dams, but green and natural infrastructure. I look forward to working with the administration to drive solutions for South Florida and the nation’s coastal communities at risk,” said Crowl. That afternoon, Crowl was invited to serve as a panelist at a briefing on Capitol Hill hosted by Congressman Carlos Curbelo (R-FL), Congressman Ted Deutch (D-FL) and Congressman Seth Moulton (D-MA), in partnership with FIU, Northeastern University and the National Oceanic and Atmospheric Administration. They discussed threats facing coastal communities across the country and ways the federal government should consider investing in making these communities more resilient. At the briefing, Crowl emphasized the significance of the National Estuarine Research Reserve System and the use of green infrastructure (e.g. mangroves) as cost-effective and resilient approaches to mitigating coastal threats. Crowl concluded his presentation by making the economic case for coastal resilience, citing a four-to-one return on investment with regard to real estate, tourism, water supply and more. Click here to watch the briefing. This week also brought FIU’s Division of Information Technology to town for the annual Internet2 global conference. While in town, Vice President and CIO Bobby Grillo hosted academic collaborators and the leadership of the West and Central African Research and Education Network (WACREN) to explore a more robust platform for research and connectivity in the region. FIU already leads domain-specific tailoring of internet technologies to support faculty research, and in the process improve graduate education through the Center for Internet Augmented Research & Assessment (CIARA). Left to right: George Corton, Josh Grodin, Robert Fatovic, Larissa Ramos, Carlos Becerra. 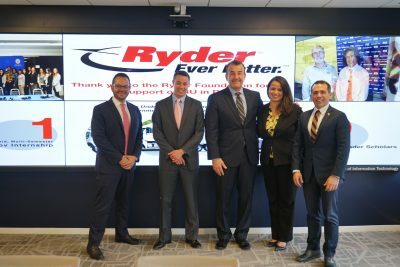 On April 26, FIU in D.C. hosted Ryder Systems, Inc. for a visit to discuss building on the partnership between Ryder and FIU’s new center in the nation’s capital. Robert Fatovic, executive vice president and Josh Grodin, director of Government Relations, represented Ryder at the meeting while George Corton, associate vice president of Advancement; Carlos Becerra, assistant vice president of Governmental Relations; and Larissa Ramos, associate director of Strategic Partnerships and Programs represented FIU in D.C.
Ryder Women Leader Scholars Nikki Jones and Yadira Maldonado also stopped by the FIU in D.C. office to personally thank the Ryder executives on behalf of 10 women leaders who received a scholarship from Ryder to attend a cybersecurity strategy and leadership class in D.C.
FIU in D.C. will work with Ryder to recruit a BizGov intern for a two-semester internship funded by Ryder, during which the intern will work at FIU in D.C. in the summer and at Ryder in the fall. To learn more about the partnership, click here. This week was another milestone week for FIU history – the Senate voted 60-38 to approve the nomination of FIU Law School Dean Alex Acosta to become U.S. Secretary of Labor on Thursday, April 27. Now former Dean Acosta was sworn in the next day by Vice President Mike Pence. Acosta is the first Hispanic member to join President Donald J. Trump’s executive cabinet. 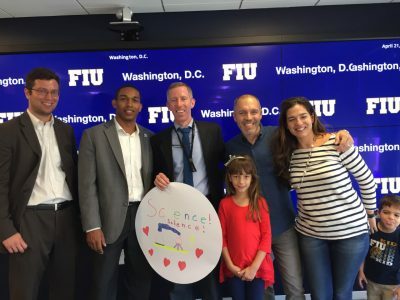 Earlier in the week, Assistant Professor and Principal Investigator John Kominoski at FIU’s Department of Biological Sciences visited Washington to take part in the March for Science. While in town, Kominoski met with congressional offices to discuss FIU’s work in the Everglades, and took time to visit with some future Panthers in town for a visit to FIU in D.C.
FIU faculty and alumni gather at FIU in DC to tour the facility. On Friday, April 27, Sean Prospect, director of FIU After-School All-Stars served as a panelist for a Congressional staff briefing on the power of after school and summer learning programs. The briefing comes on the heels of President Trump’s budget blueprint, which zeroes out funding for the 21st Century Community Learning Centers, an after-school program aimed at improving academic outcomes. Another first for FIU in D.C., Laurie A. Watkins, author of Go from Stressed to Strong hosted a book signing event April 19, which included a discussion about health and fitness with special guests from the book.